Smoked cured diced pork with spices. Our pancetta is made by a family run company that has been producing charcuterie for eight generations dating back to 1812. We have worked together for over 20 years to deliver an authentic Italian flavour. Pork belly seasoned with herbs and spices, and delicately smoked. Pork Belly, Salt, Spices (White pepper, Nutmeg), Antioxidant (Sodium Ascorbate), Dried Garlic, Preservatives (Potassium Nitrate, Sodium Nitrite), Coriander Extract. 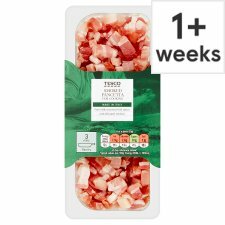 Prepared from 110g of Pork per 100g of Smoked pancetta cubes. Always wash hands, surfaces and utensil after contact with raw meat. Pan Fry: Fry in a little oil for 2-3 minutes, turning occasionally.